In England and many other countries around the world, the standard of proof to be met by the prosecution in order for the jury to convict an accused is proof “beyond reasonable doubt” or proof that makes the jury “sure” of guilt. These phrases are supposed to convey a very high standard of proof. It is thought to require the jury to be at least 90% convinced of guilt. Barristers and evidence scholars Adrian Keane and Paul McKeown respond to some questions from the Higher Education Law team at Oxford University Press. Why should we have such a high standard of proof? Adrian Keane: Because it reduces the risk of convicting the innocent. It is sometimes linked to the principle that it is better that ten guilty persons are acquitted than that one innocent person is convicted. Do the jury get any help on the meaning of “beyond reasonable doubt”? Paul McKeown: In England, generally no help is given. Judges are advised not to define the phrase to juries other than to say that it means the same thing as being “sure”; and they are also advised not to define “sure”. Where juries ask for help on ‘reasonable doubt’, judges are advised to tell them that they can discount ‘fanciful doubts’. But doesn’t everyone know what “beyond reasonable doubt” means, if only from watching TV dramas? AK: No. Research shows that the figure, in percentage terms, at which jurors would be convinced of guilt ranges from 51% to 92%; and just under a quarter of them think that “beyond reasonable doubt” means “pretty likely” or “very likely”. But presumably the range narrows, perhaps to a band of over 90%, if the jury are told that “beyond reasonable doubt” means the same as “sure”? PM: No. The research shows that the range then becomes even wider, from 50% to 100%. Why is the range so wide? PM: If the judge does not define “beyond reasonable doubt” and “sure”, juries are likely to give these words their ordinary meanings. Dictionary definitions of “reasonable”, for example, include “rational” and “moderate”. But if the jury are told that “beyond reasonable doubt” means the same as “sure”, presumably the jury will only convict if they are certain of guilt? AK: Research shows that when members of the public were told that the test is simply “sure of guilt”, only 51% of them said that they would have to be 100% sure before convicting. Why only 51%, given that “sure” means certain? PM: It is true that “sure” can mean feeling certain in one’s mind, but it can also mean feeling confident, and there can be degrees of confidence. For example, when someone says that they are “sure” about something, it is not uncommon for someone to ask “How sure?”. It is also likely that some jurors are understandably confused about being told that “beyond reasonable doubt” means the same as “sure”: one meaning of “sure” is having no doubt, i.e. no doubt at all, which, whatever the judge says, cannot mean the same as having no reasonable doubt. If what you are saying is correct, then what is the consequence? PM: Well, at the very least it means that the risk of convicting the innocent is higher than it should be. AK: We should jettison both “beyond reasonable doubt” and “sure” in favour of a better description of the criminal standard of proof. What would be a better definition? AK: Well, it’s not going to be as snappy as the traditional definitions, but it will be much more accurate. The jury should be told that whatever they may have heard, the test is not “beyond reasonable doubt” or “sure”; that the standard of proof required is a very high standard; that it is not enough that they think the accused is probably guilty or very probably guilty; that they don’t have to be absolutely certain; but that if they have a real doubt, rather than a doubt based on an extremely remote possibility, they should acquit. Wouldn’t it be simpler to say you have to be at least 90% convinced of guilt? PM: It would be simpler, and it seems like a tempting solution, but the jury’s overall conclusion of guilt or innocence depends upon how it decides on the facts that are disputed. Finding the facts is an exercise that only rarely depends on precise degrees of probability, an example being facts derived from DNA evidence. Normally jurors will simply not have enough data to find facts on the basis of precise percentages. Featured image credit: Unnamed by MichaelDBeckwith. CCO Public Domain via Pixabay. Adrian Keane is Emeritus Professor of Law at City, University of London and the former Dean of the Inns of Court School of Law. 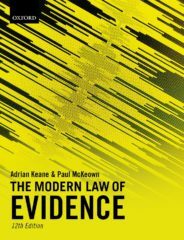 He is co-author of The Modern Law of Evidence, an authoritative text that has been cited worldwide. He is also a co-author of Blackstone’s Criminal Practice and Blackstone’s Civil Practice and has written numerous articles on the law of evidence for both learned journals and the popular press. Paul McKeown is Associate Professor of Law at City, University of London, co-author of The Modern Law of Evidence, author of many case commentaries on evidence in The Criminal Law Review and convenor of the Evidence & Proof Forum of the Centre for the Study of Legal Professional Practice, City, University of London. Any sensible new language for a guilty verdict may work no better in actual use than the current one. This fruitless outcome of a change can be forestalled. groups. Each group uses a different guilty standard to decide the same case. The results for the different groups can be compared.